Hellen admits that she fell into the nursing profession largely by chance. 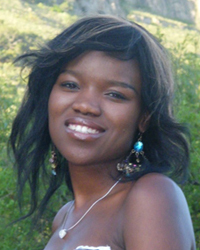 However, her passion for helping those less fortunate and her ability to “think big” has led her to not only become the dedicated maternal health professional that she is today, but also a leader in the maternal health field in South Africa who has spoken about maternal health issues on national TV. She has identified the lack of coordination and communication between hospitals, clinics, pharmacies, NGOs, community health centers, and pregnant women as a key barrier to maternal health referrals and record keeping in and around Johannesburg. To address this challenge, she has created a holistic database system to coordinate efforts between all entities. Watch Hellen discuss PMTCT on health-e.org. Indu Capoor is building a network of health agencies in India as a way to provide them with resources and trainings while mobilizing institutions with a common mission to take a strong policy stance. Her organization, CHETNA, facilitates consultations with stakeholders – including government representatives, citizen sector organizations (CSOs), the corporate sector, and health service beneficiaries – and advocates for policies in health issues ranging from early childhood care to HIV/AIDS, from traditional healing practices to gender communication. While CHETNA focuses primarily on second-tier (training and documentation) and third-tier (advocacy and policy consultation) work, it still pilots field programs if they are innovative, including a recent program implementing participatory trainings on birth attendance. The organization has also created publications that reach the broader Indian public, including a set of picture books educating midwives on safe practices. It has also created a number of publications that advocate for specific policy changes. To read more about Indu’s organization, click here. In coordination with the National Rural Health Mission (NRHM) and CHETNA, Hellen will help introduce the concept of birth preparedness and complication readiness (BPCR) in one primary health center in Rajasthan. The project will introduce BPCR by engaging community stakeholders at all levels: nurse midwives, vehicle owners, women’s and mother’s groups, and Village Health and Sanitation Committees. Hellen will contribute to the project by (1) identifying the intervention district and partner, (2) identifying a research agency to examine the impact of the intervention, (3) planning the program formalization meeting with involved partners, (4) building capacity of trainers and staff, (5) developing tools and communication materials for the project, and (6) engaging in community level activities.